Canadian Interuniversity Sport announced Friday the women’s hockey roster for the 2017 Winter Universiade, set for Jan. 29 – Feb. 8 in Almaty, Kazakhstan. Canada will be looking to reclaim the gold medal, after falling to Russia 3-0 in the 2015 championship game in Granada, Spain. The loss marked the first time the Canadians hadn’t won the event since women’s hockey’s debut at the FISU Games in Harbin, China in 2009. 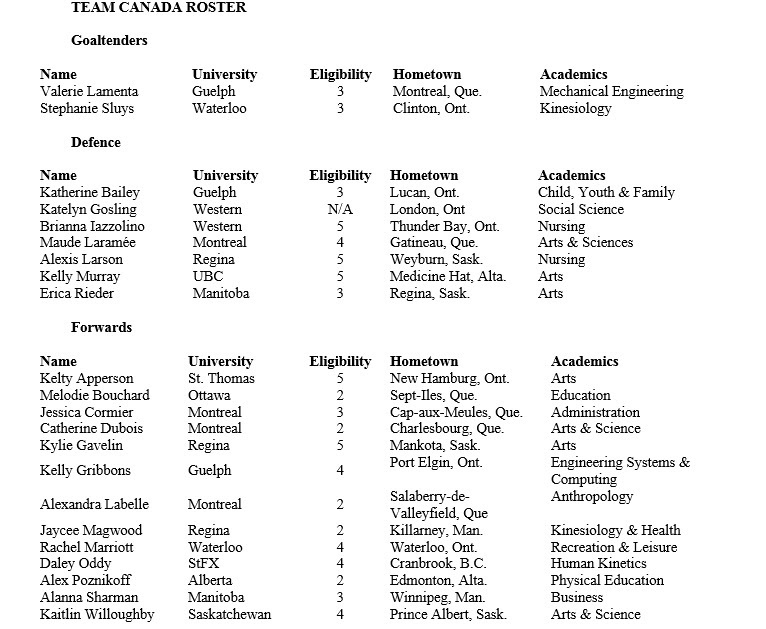 The 22-player roster features 20 members who skated for Team CIS at Hockey Canada’s Women’s Development Camp in August. 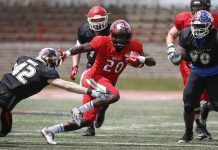 Eight players come from the Canada West conference, along with seven from OUA, five from the RSEQ and two from AUS. The defending national champion Montreal Carabins lead the way with four selections. Canada will compete in Group A alongside China, Great Britain and host Kazakhstan. Group B consists of the defending champion Russia, Japan and the United States. Returning from the 2015 Universiade squad, former Western defenceman Katelyn Gosling headlines the roster. Gosling, a CIS champion with the Mustangs two seasons ago, took part in Hockey Canada’s Fall Festival with the women’s national team after being drafted over the summer by the Canadian Women’s Hockey League’s (CWHL) Calgary Inferno. On the blueline, Gosling is joined by Mustangs teammate Brianna Iazzolino, Guelph’s Katherine Bailey, Montreal’s Maude Laramée, Regina’s Alexis Larson, UBC’s Kelly Murray, and Manitoba’s Erica Rieder. Up front, Canada will be led by Montreal’s Alexandra Labelle, who scored a hat-trick in the CIS championship game last spring. 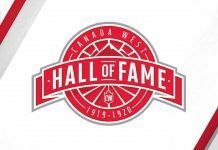 The offence also includes fellow Carabins Catherine Dubois and Jessica Cormier, St. Thomas’ Kelty Apperson, Ottawa’s Melodie Bouchard, Regina’s Kylie Gavelin and Jaycee Magwood, Guelph’s Kelly Gribbons, Waterloo’s Rachel Marriott, StFX’s Daley Oddy, Manitoba’s Alanna Sharman, Alberta’s Alex Poznikoff, and Saskatchewan’s Kaitlin Willoughby. Behind the bench, University of Guelph head coach Rachel Flanagan, who made the selections following development camp, will be accompanied by team leader and video coach Rick Traugott, assistant coaches Kelly Paton (Western) and Shaun Reagan (Waterloo), equipment manager Jean Huynh (McGill), and therapist Natalie Paladino (Windsor).